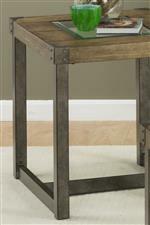 Tempered glass table-top inserts, square-frame metal legs, and a light and lovely ash finish. Modern industrial design with a variety of materials makes this collection an eye-catching addition for your living space. The Freemont Occasional Table Group by Jofran at Dunk & Bright Furniture in the Syracuse, Utica, Binghamton area. Product availability may vary. Contact us for the most current availability on this product. 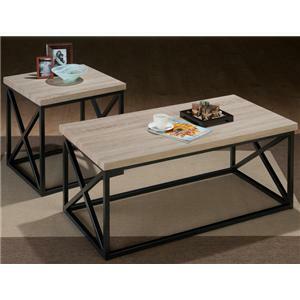 965-4 Sofa Table 1 48" 18" 28"
965-3 End Table 1 22" 26" 24"
965-1 Cocktail Table 1 48" 28" 18"
The Freemont collection is a great option if you are looking for Industrial Transitional furniture in the Syracuse, Utica, Binghamton area. Browse other items in the Freemont collection from Dunk & Bright Furniture in the Syracuse, Utica, Binghamton area.